Presumably this means that Mr. Trump thinks he will do better with Supreme Court Justices if and when these cases are taken up on appeal—a lengthy and complex process, to say the least. But listening to Chief Justice John Roberts on immigration issues might be useful for the Trump team. In addition to the Constitutional issues at play, which are innumerable, there’s the question of just how much more power the Supreme Court is willing to give the executive branch to pursue it’s goals without interference from the other two branches of government. 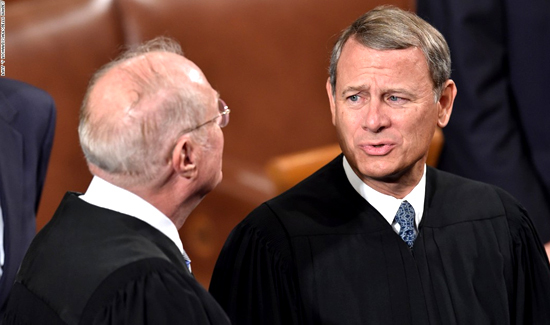 (Reuters) – U.S. Chief Justice John Roberts took issue on Wednesday with the Trump administration’s stance in an immigration case, saying it could make it too easy for the government to strip people of citizenship for lying about minor infractions. Roberts and other Supreme Court justices indicated support for a deported ethnic Serb immigrant named Divna Maslenjak over her bid to regain her U.S. citizenship after it was stripped because she falsely stated her husband had not served in the Bosnian Serb army in the 1990s after Yugoslavia’s collapse. Roberts seemed particularly concerned that the government was asserting it could revoke citizenship through criminal prosecution for trivial lies or omissions. He noted that in the past he has exceeded the speed limit while driving. If immigrants failed to disclose that on a citizenship application form asking them to list any instances of breaking the law, they could later lose their citizenship, the conservative chief justice said. “Now you say that if I answer that question ‘no,’ 20 years after I was naturalized as a citizen, you can knock on my door and say, ‘Guess what, you’re not an American citizen after all? '” Roberts asked Justice Department lawyer Robert Parker. Roberts described the administration’s interpretation as inviting “prosecutorial abuse” because the government could likely find a reason for stripping citizenship from most naturalized citizens. “That to me is troublesome to give that extraordinary power, which, essentially, is unlimited power, at least in most cases, to the government,” Roberts added.